The number of homes advertised for short-term letting on Airbnb has risen by more than 1,000 in the last year, despite the housing crisis. Homeowners appear to be cashing in before a summer crackdown, with some earning more than €200,000 in the last year letting their properties. The new figures show 5,855 entire homes were available for hire in Galway, Dublin, Cork, Limerick and Waterford on December 11, up 1,015 on the same month last year – a rise of 20pc. Waterford, with increases ranging from €6 to €24 a night. Airbnb and other short-term letting websites allow property owners to advertise a home online for holiday stays. There have been crackdowns in other countries amid fears that people living in areas of high demand are squeezed out of the housing market because owners choose the lucrative short-term letting market rather than lease properties long term, but for less money. 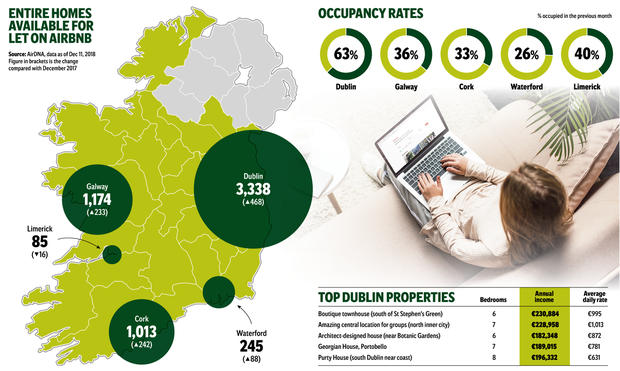 Some €230,884 has been spent in the last year renting the top-ranked property, described as a ‘boutique townhouse in the heart of Dublin’. Nine properties in the capital are listed with an average nightly rate of €1,000 or more, with the most expensive costing €1,517 for a single night. The figures come in advance of a Government crackdown on short-term lettings, which is due to take effect from next June. Under the new regime proposed by Housing Minister Eoghan Murphy, homeowners will only be allowed to let their properties for no more than 14 days at a time, and for no more than 90 days a year. For short-term lets above 90 days, planning permission will have to be granted to allow the property be used on a commercial basis. :: In all, 1,604 property owners rent one or more properties on the website. The hospitality sector has also complained of a two-tier holiday letting market emerging, with Airbnb properties not subject to the same regulations as hotels or B&Bs. Anybody letting on Airbnb will also be required to register with the local authority, and provide information about the property, the number of days they intend to let it for, and an annual return setting out how often it was let on a short-term basis. Dublin City Council will be given additional resources to monitor and implement the new system. Owners who are found not to be compliant with the new rules will be subject to prosecution. Meanwhile, St Vincent de Paul (SVP) said it had noted a surge in calls from people struggling to pay high private rental costs in addition to their other bills. The charity said that it expects no slow-down in the calls for help it will receive this year. Help with the costs of food, fuel, education and utility bills remain the highest number of requests from families struggling on inadequate incomes, but the charity has reported that high rents are putting additional pressure on finances. “We are increasingly receiving calls for help from people unable to meet growing costs of private rental accommodation and being forced to make choices about the use of scarce income,” said SVP national president Kieran Stafford. Early in November, Mr Stafford predicted that the society would receive about 50,000 calls for help over the winter months. But this figure will now be exceeded in the new year, as the society has already gotten almost that number in November and December alone. Calls for help to SVP are now running at more than 130,000 a year, which is around 11pc more than five years ago. “The improvement in our economy is very welcome, but it has not improved conditions for everyone,” he added Mr Stafford. This year is the 175th anniversary of the foundation of SVP in Ireland. During that time it has provided help and support to those most in need through the Famine in the 19th century, two world wars, an uprising, a civil war and cycles of economic austerity. In addition to providing direct assistance to those in need, SVP manages 10 hostels providing emergency beds, provides almost 1,000 units of social housing, operates five holiday homes, seven resource centres, four prison visitor centres, 224 charity shops and other social support activities. It also has an active Young SVP programme in schools and third-level colleges and universities. Eleven years prior to its establishment in Ireland, the society was founded in Paris by Blessed Frédéric Ozanam, then a 20-year-old university student. He and six companions set up a ‘Conference of Charity’ visiting poor people, bringing food, clothing and friendship in a confidential non-judgemental spirit. They adopted St Vincent de Paul as their patron.